No, this review is not about the Junior’s on Flatbush Avenue in Brooklyn. 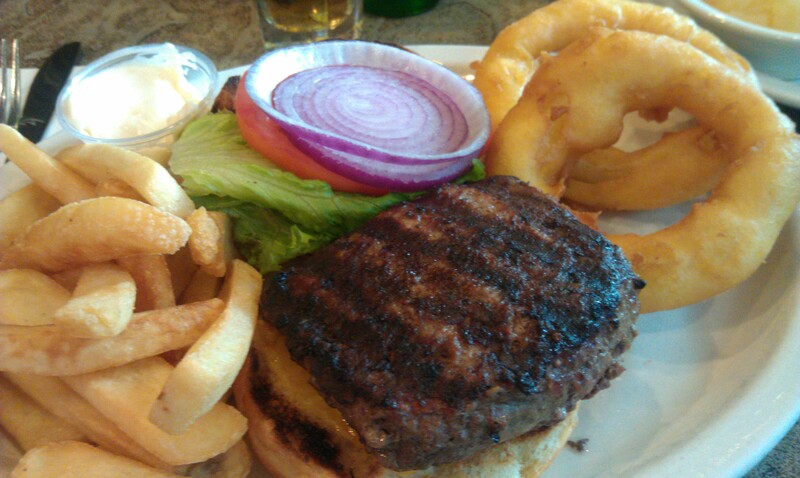 We tried the Junior’s in Times Square, fitted with ample outdoor/indoor seating that is constantly filled. Why would a New Yorker go to such a place? I’m almost certain we were the only non-tourists in our section, if not the entire restaurant. Well, there’s the famed cheesecake. Then, there are the steakburgers. And there’s something called Something Different which piqued our interest. So, Junior’s on a Friday night during pre-dinner-eating-time it was. We thought we’d try a nearby bar afterward but were too stuffed to move, let alone imbibe. It seemed like less than 10 minutes had gone by before our food came out. 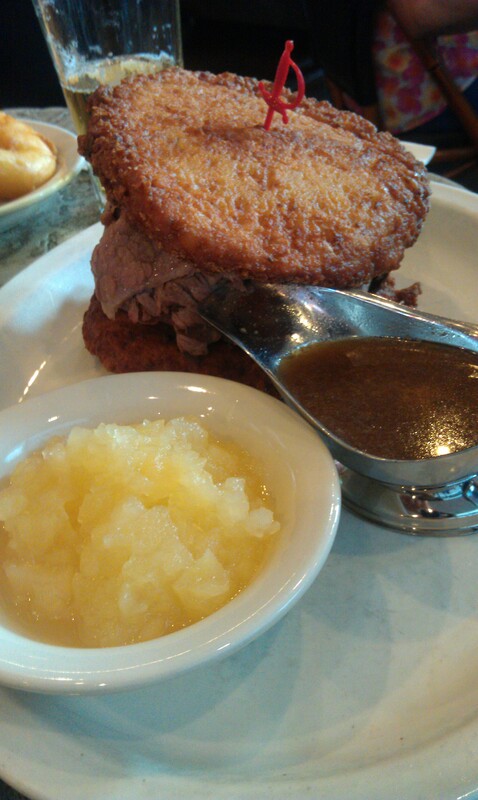 My dining partner ordered Something Different, a potato-pancake-and-brisket sandwich with Au Jus and applesauce on the side. The potato pancakes were dense and delightful, warmly paired with the flavorful brisket, the highlight of the dish. The brisket was thinly sliced and evenly cooked–just the way it should be. I didn’t try the applesauce but MDP seemed to enjoy it. 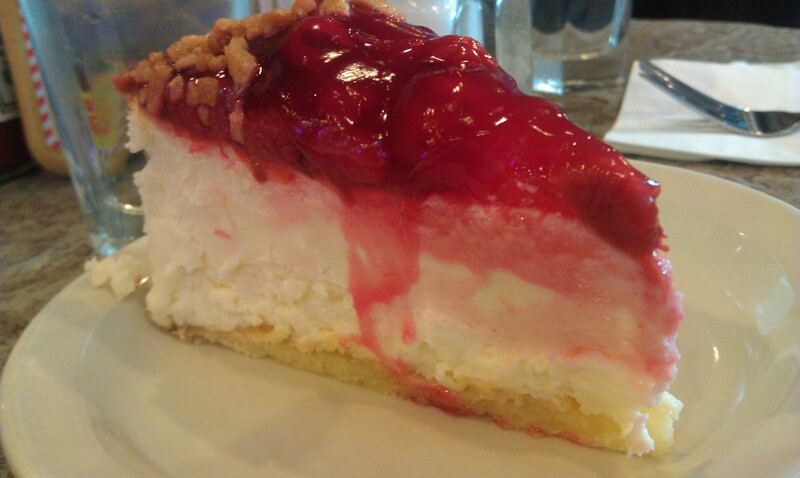 Any meal at Junior’s could not be complete without having a slice of their famous cheesecake. The menu listed several selections to choose from, fresh strawberries with cheese pie among them. What exactly is cheese pie? Is this a flatter, less dense version of cheesecake? I don’t want to know. We opted for the cheesecake with cherries–a classic. It was creamy and decadent, and perfect. Next to Junior’s restaurant is a Junior’s bakery where patrons can eat-in or take-out pieces of cheesecake. You might want to try this if the restaurant feels too overwhelming.